Please select your prefered Length (dash number) from the list below. Some lengths may be special order or limited stock availability. Other lengths are also available, please contact us for details. 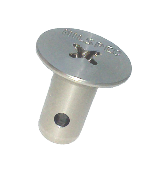 * Each new stud will require a new cross pin and maybe a new grommet. So be sure to add them before checking out, and don't forget about the installation tools. We keep all of these items in stock to make your project go smoothly.